I started reading H.G. Adler’s Panorama over the long weekend, and I’m still early in, but I’m blown away by the way that Peter Filkins has rendered Adler’s flowing narrative voice, details tumbling one after the other as filtered through the perspective of a young child, not quite as poetic and pointillist as the early pages of Portrait of the Artist as a Young Man but setting down into words a similar sense of wonder. (I know enough to know that the boy will grow up, and his experiences will become much less wonderful, but that foreknowledge isn’t stopping me from being captivated by each page I see now.) Here, Filkins talks about the challenges of rendering into English not just the words Adler wrote, but the consciousness with which he infused them. The phrase “lost in translation” usually refers to what fails to be carried over from the original to the target language. However, in taking on the novels of H.G. Adler, I have often felt lost to and utterly consumed by the subtlety of Adler’s prose and the uncanny way that the consciousness of the author remains always at one remove from the narration itself, and yet present in every sentence. This was most obvious when I translated the Holocaust phantasm of Adler’s novel The Journey, for there the multiplicity of anonymous voices obliquely tied to the oppressors and their victims served as the woven fabric of Adler’s own present sensibility amid the prose. In Panorama, this at first seemed less obviously so, for as a species of Bildungsroman it uses an omniscient third-person narrator to render the more straightforward development and life of Josef Kramer, the book’s protagonist. In that admission—“nor is Josef sure”—lies the crux of the issue, and such ambivalence and confusion about just who one is also applies to Adler himself. On one level we are told that Josef is unsure of who he is, but on an immediate second level we realize that it is Josef who is telling us that Josef is unsure of who he is. A third level would then imply that it is Adler telling us of the narrator Josef telling us that the character Josef is unsure of who he is, while all of this is further undermined by Adler’s own lack of surety about his place and identity amid the narrative screens of his Panorama. 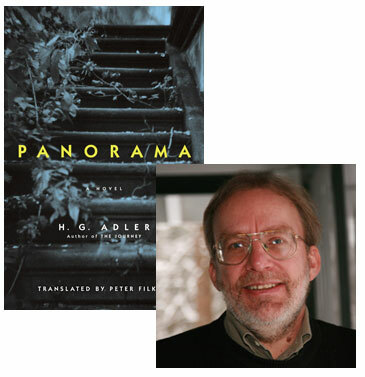 Clearly the stakes for Adler in writing Panorama were no less than the need to survive his story and the telling of it. Yet there are also stakes to translating it. Given that Adler produced 26 books of fiction, poetry, history, philosophy, and religion, and that he did it all while living in utter obscurity in London after the war, the translator cannot help but feel both the exhilaration and the burden of trying to lift his voice out of the silence. Nuanced and complex, mercurial and shape-shifting, Adler’s voice exists as much between the lines of his prose as it does within them, and to simply render what the words say in lock-step fashion is to risk losing hold of it and of him. On the other hand, to pronounce too strongly the anguish that he suffered is to betray the artist’s joy in ordering experience that drove his work for decades. Somewhere between exists the cat’s cradle of consciousness that both reports and disguises its own existence, this being a condition inherent to that of the translator as well. To translate Adler is to translate this paradoxical condition. To attempt to do it justice requires getting a bit lost amid the converging crossroads of history, language, memory, biography, and art as well.